James was born to John & Adelaide in July 1892 in Northampton one of 4 children. Between 1901 & 1911 his family moved to Hunter Street Rugby his father was a stonemason. He became an apprentice at BTH and completed it in May 1913. He joined the Kings Royal Rifle Corps on the 2 September 1914 on a 3 year short service attestation and was assigned to the 2nd Battalion and later the 7th. He died on the 7 August 1915 of war wounds at ‘The Action of Hooge’ at Flanders and is buried at Etaples Military Cemetery. He was awarded the 1914/15 Star, Victory Medal & British War Medal. At the age of 23 he was one of 12,840 men who lost their lives at the battle. William Tomlinson was born at Hyson Green in Nottingham in 1891. He was the youngest child of the 7 living children of Henry, a Lacemaker, and Harriet Tomlinson. In 1911 he was working as a Carriage Hand in a Lace Factory in Nottingham. On 28 December that year he moved with his parents to 20 James Street Rugby as his elder brother Ernest’s wife had committed suicide by drowning in the Brownsover canal leaving 15 month old baby Jim to be looked after. William then worked in the Pattern Shop at the BTH Rugby. He was 5’6″ tall and 35 days short of his 23rd birthday when he and his elder brother Ernest enlisted with the King’s Royal Rifle Corps, 7th Battalion on 3 September 1914 and were posted to Aldershot on 5 September. On 19 May 1915 they landed at Boulogne and fought in France and Flanders. The British Infantry had captured Hooge on 19 July but on 30 July the Germans used their new flame throwers and reclaimed their positions. William R/79 a Rifleman was shot and killed on 31 July 1915 and his brother Ernest was shot in the head & badly injured at the same time. William was awarded the British Star, British War Medal and the Victory Medal. 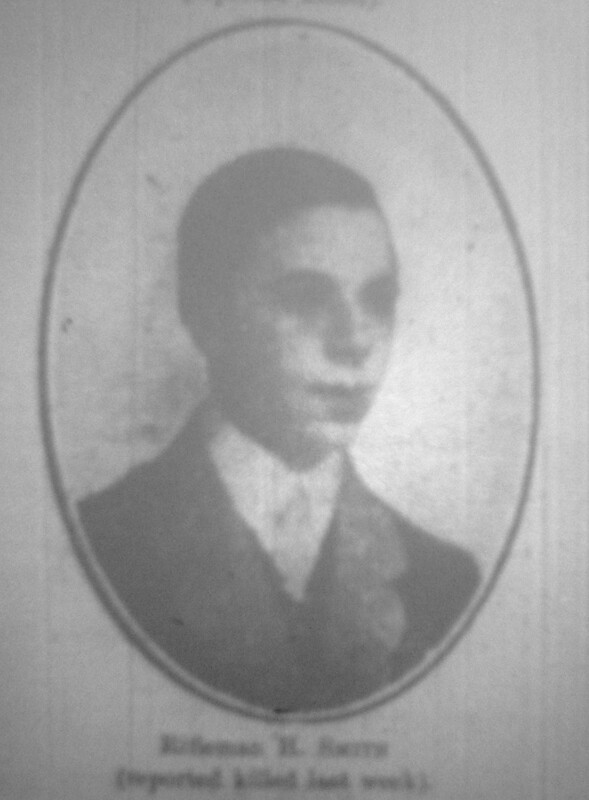 Photo of William Tomlinson in February 1914. Herbert Smith’s birth was registered in April 1894 in Rugby. His parents were Edwin and Elizabeth Ellen Smith, née Mawby, who were married in 1885. Herbert had two older siblings, William and Mabel Nellie. In 1901 the family were living at 21 Rokeby Street, Rugby. Herbert’s father was an Engine Driver with the L & N-W Railway. In 1911 the family were living at 186 Oxford Street. His father was still working at the L & N-W Railway and Herbert, aged 17, was a newsagent’s assistant. By the time war broke out Herbert was employed in the wagon department on the railway. He was a teacher in the Sunday School and member of the Bible Class at the Wesleyan Church in Cambridge Street. The Rugby Advertiser reported that he was the third young man from the Church to give his life in the war. Herbert enlisted as a Private in the 7th Battalion of The King’s Royal Rifle Regiment, regimental number R/1621 and he went out to France. He was awarded the Victory, British and 1915 Star Medals. Herbert has no known grave but is commemorated with honour on the Menin Gate Memorial at Ypres, on Panels 51 and 53, and on the Memorial Gate at Rugby. John Henry Preston’s birth was registered in the fourth quarter of 1883 in Rugby. He was the son of George William Preston and Zillah Taylor. In 1901, John Henry was aged 17 and a House Painter living with his family in 68 South Street, Rugby. In 1911 he was still with the family but now at 97 Wood Street, Rugby. He was still a house painter. On 2 September 1914 he enlisted in the 7th Battalion of The King’s Royal Rifle Corps and his regimental number was R/78. 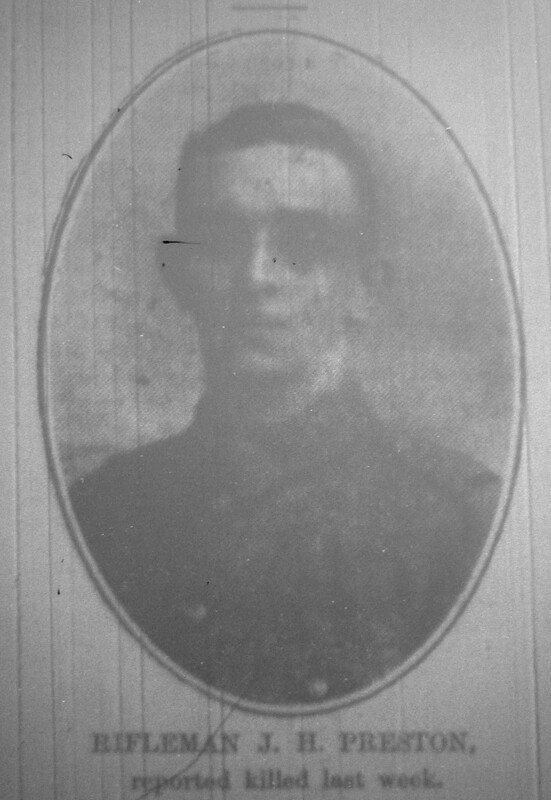 “A note was received by Mr G W Preston of 97 Wood Street Rugby on Thursday morning that his son, Rifleman John Henry Preston, of the King’s Royal Rifles, had been killed in action. The message came from the Captain of the Company to which deceased belonged, and briefly stated that he was killed on July 30th. It has not yet been officially confirmed. John Henry Preston is remembered on the Ypres Menin Gate Memorial, Panel 51 and 53 and on the Rugby Memorial Gate. He was born on 15th December 1895 at 15 Rossetter Gardens Flood Street South Chelsea London his father it says on his birth certificate was William Henry Pee and his mother Annie Elizabeth Pee formerly Andrews. Frederick or should I say Frederic as his birth certificate says was registered 1896 Q1 Chelsea, he was the 4th child of William Edward or William Henry Pee and Anne Elizabeth Andrews, sometimes called Andrew, although his father appeared on his birth certificate it was always a saying in the family that Eric Pike was his father but that’s another story. Frederic in 1901 census was living as Fred Allen age 5 with his mother Elizabeth Allen age 26 and 4 siblings at 391 Spoilbank Rugby; we still don’t know why the family called themselves Allen. No father in the household. Frederic in 1911 age 14 he was Frederick Branston and a paper deliverer for Whymans newsagents and living 391 Clifton Road Rugby with his step father Henry Branston his mother Elizabeth and 4 siblings, his mother Elizabeth had married Henry Branston 6 months earlier. He was Frederick Pee when he “joined up” on 8th September 1914 and his regimental number given was S2152 in the 8th Battalion Rifle Brigade. He was 19 years and 30 days old and his trade was Press hand he was 5ft 6 inches tall he weighed 115 lbs his chest expansion was 34 inches and his range of expansion was 2 inches. Our Frederick was not a perfect soldier on 6th December 1914 Frederick was at Grayshott and was late “falling in” on Church Parade, punishment was 3 days CB i.e. Confined to Barracks name of witness was Company Quarter master sergeant Jackson, punishment was awarded by the Captain, he again committed an offence on 8th December 1914 while at Grayshott his offence was making an improper reply to an NCO i.e. None Commissioned Officer witnessed by Corporal Belbow and Sergeant Browning, and again on February 14th 1915 our Frederick was absent from midnight on 14th February his punishment was 4 days CB i.e. Confined to Barracks and on 26th February 1915 —-? Illegible rank his punishment was 2 days no pay. His Medal card tells us he was awarded the Victory, British and 15 Star Medals. His mother Elizabeth Branston signed for the 15 Star Medal on 15th March 1919 and signed for Victory medal on 10th August 1919 it also confirms British Star Medal was despatched to Mrs E Branston of 19 Houston Road Rugby on 16th February 1921. His military history tells us his entitlement went from 7th September 1914 to 19th May 1915 and looks like 253 days he got another 72 days entitlement from 20th May 1915 to 30 July 1915 he was reported missing or killed in action on 30th July 1915. He was in France on 20th May 1915. In May 1919 Statement of names and address of all the relatives of Private Frederick Pee gives his mother Elizabeth Branston age 46 and his brother John William Pee age 26 both living 19 Houston Road Rugby his married sister Ellen Elizabeth Montgomery age 28 living at 32 Sandown Road Rugby and his other sister Florence Pee age 25 living 19 Houston Road Rugby. 17th September 1919 Memorandum effects form 118a from the Officer in charge Infantry Winchester to the War Office Imperial Institute South Kensington London SW7 says that any article of personal property now in the possession of Mrs Elizabeth Branston of 32 Sandown Road Rugby it also adds any medals granted to the deceased that are now in your possession or that may hereafter reach you should be disposed of to Mother and it is signed by C Harris Assistant Financial Secretary. Frederick Pee S/2152 8th Bn Rifle Brigade who died on 30th July 1915 is remembered with honour on the Ypres (Menin Gate) Memorial. James ‘Jenkins’ is recorded on the Rugby Memorial Gates as JENKINS J. S., and proved very difficult to identify. His story will explain why. James was born in about January 1895, in the town of ‘Mexico’, in the United States as James SIMS. Mexico is a town in the northeast part of Oswego County, New York state. His mother Louisa Margaretta Evans, was born in Swansea in 1870, the daughter of William and Louisa Evans, and she was 10 months old and living in Swansea for the 1871 census. Her marriage to James’s father, William James Sims, was registered in the Swansea registration district in the first quarter of 1892. Very little census information is available, and it seems likely that the family spent much of their time abroad, seeing that James was born in the USA. At some date James came to Rugby and the BTH records show that he was employed as a ‘winder’. Fortunately James’s Service File has survived in The National Archives ‘Burnt Records’, although some sections are not legible or are now missing. It is these that have helped ‘reunite him with his name and family’ and provided the evidence of his birth in America. Just before the war, James had been an apprentice and his Attestation noted that his ‘leave to enlist expires August 1916’. When he joined up he was 5ft. 9⅓in. tall, weighed 131lbs., and had blue eyes and brown hair. 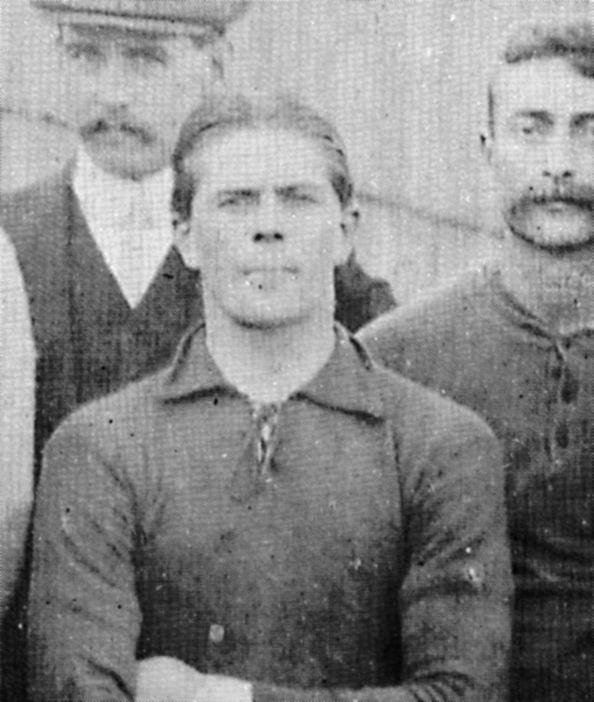 James enlisted at Rugby for three years on 31 August 1914, as Private No. A/3456, in the 8th Battalion of the King’s Royal Rifle Corps. He was 19 years and 216 days old and was posted to his unit on 3 September 1914. After 216 days ‘Home Service’, during which time he would have been at the Winchester Depot and elsewhere undergoing training, he went out to France on 19 May 1915, landing at Boulogne. He was ‘killed in action – in the field’, 73 days later, during the Battle of Hooge Crater on 30 July 1915. 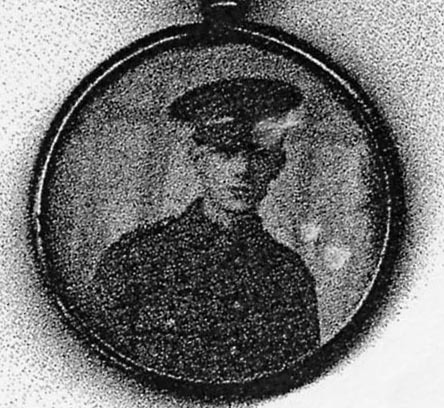 James was awarded the 1914-15 Star – received by his mother on 25 March 1920; the British War Medal – received on 2 February 1921; and the Victory Medal – received on 18 May 1921. James Henry SIMS has no known grave but is commemorated on the Menin Gate Memorial, Panels 51 and 53. The Commonwealth War Graves Commission record noted that he was the ‘Son of Mrs. Louisa Margaretta Sims’. However, there is no record of a James Sims on the Rugby Memorial Gates. It seems that his father had died, and his mother had ‘remarried’ although, again, there appear to be no formal records, and quite possibly, his death and her remarriage were actually both abroad. His Service Records include documents detailing his next of kin, to allow payment of outstanding back pay and gratuities. The form was postmarked Winchester, and then ‘Rugby Station’ on 12 May 1919, but the return was not signed by his mother until ‘23 July’ – the year being burnt, but presumably 1919. His father, Henry James Sims was recorded as deceased. His mother had moved house and was now recorded as Louisa Margretta Jenkins of 49 Manor Road, Rugby. There were two younger brothers, ‘of the full blood’, named in the army records: William Frederick Albert Sims, and George Stanley Sims, then aged 21 and 18 respectively, suggesting births in about 1898 and 1900. There were also three children who were ‘of the half blood’: William ?Freeon? Jenkins, then 14, having been born in about 1905; and two girls: Daisy and Mabel Jenkins, then aged 12 and 10 born later. The names and ages would suggest that James’s father died sometime about 1900, and his mother remarried [or commenced a relationship] with a Mr. Jenkins by about 1904. The first payment of James’s financial effects, on 26 February 1916, was to’ Mrs Louisa Margaretta Sims Jenkins’, who received £4-13-9d. James’s two brothers received payments of £1-3-6d each. His mother received a further £3 on 5 September 1919. It was no doubt his mother’s new surname that caused the confusion and use of the Jenkins surname for James on the Memorial Gate, and in the BTH Memorial Book. The BTH Memorial Book records ‘Jenkins J H S – Winding Dept., Rugby – Rifleman – King’s Royal Rifles – 3456 – killed 30 July 1915’ as serving. He is then recorded in the Roll of Honour as ‘Jenkins H S’ with exactly the same details. However, the list of names on the BTH War Memorial as reported in the Rugby Advertiser, on 4 November 1921, included him as ‘SIMS James H’. A ‘SIMS W F A’ is also recorded as ‘serving’ and was also in the BTH ‘Winding Department’ at Rugby. He was a ‘signalman’ in the Royal Naval Division, No. BZ 2304. This would have been James’s brother, William Frederick A Sims, who seems to have retained his original surname – no doubt as he was available to correct matters. 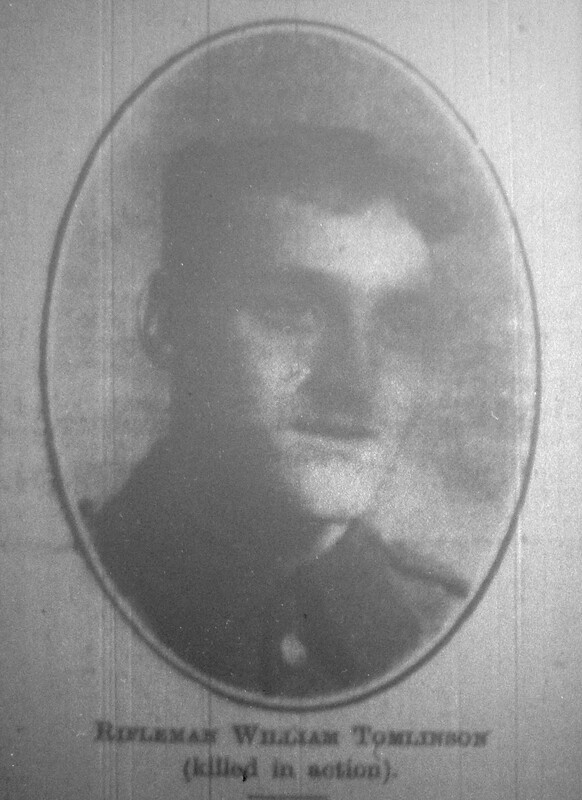 The list of BTH casualties also included a SIMS Frank William W. He seems to be unrelated, although working in Rugby, and seems to have been Private, No: 295288, who served in 2nd/4th Bn., London Regiment (Royal Fusiliers), and who was killed on 26 October 1917; he also has no known grave and is remembered on the Tyne Cot Memorial.